Two figure skaters who won titles in dramatic fashion at the World Championships in Moscow have earned the United States Sports Academy’s Male and Female April Athlete of the Month Awards. Canadian figure skater Patrick Chan won the Male Athlete of the Month Award after breaking three world records en route to a world championship title. 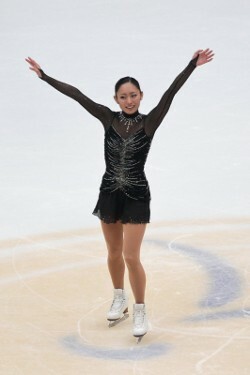 Meanwhile, Miki Ando earned the Female Athlete of the Month by winning the women’s world figure skating championship when she overcame Olympic gold medalist Kim Yu-na and the earthquake and tsunami devastation in her homeland of Japan. Chan, who won his first world figure skating, set a world record in total score with 280.98 points, which smashed the previous world record of 264.41 set in 2008. Chan also now owns records for the free skate by scoring 187.96 and in the short program by totaling 93.02. Ando’s second world title comes in the competition that was originally scheduled in Japan before it was hit by an earthquake and tsunami in March and moved to Moscow. Ando scored 130.21 points in the free skate and accumulated 195.79 points overall. Stacy Lewis was runner up to Ando in the Female April Athlete of the Month voting. Lewis won the Ladies Professional Golf Association (LPGA) tour’s first major of the season at the Kraft Nabisco Championship in Mission Hills, Calif. Lewis blistered the tournament’s final nine holes to overcame a three-stroke deficit in the last round to the world’s top-ranked player, Yani Tseng. It was Lewis’ first major tournament title after shooting a 13-under 72-hole total of 275. Finishing second in the male athlete category was Charl Shwartzel. The South African golfer won his first major tournament, capturing the 75th Masters at Augusta National with a 14-under 274. Schwartzel became the first Masters champion in history to finish with four straight birdies, including a 20-footer at the final hole. He shot a 6-under 66 for the best final round by a winner in 22 years. Third place winners were Dwight Howard, an Orlando Magic professional basketball player and University of Alabama gymnast Kayla Hoffman. Howard became the first player in league history to be named the National Basketball Association’s Defensive Player of the Year for three consecutive seasons. Hoffman earned the 2011 Honda Sports Award as the nation’s top collegiate female gymnast, after the Alabama senior was runner-up in the National Collegiate Athletic Association (NCAA) national championships in the all-around and balance beam competitions. The public is invited to participate in the worldwide Athlete of the Month nominating and balloting processes. Visit the Academy website and submit your vote, and return to the website the first week of each month to vote on the Athlete of the Month. Winners will be announced on the Academy’s website and in the online edition of The Sport Update.